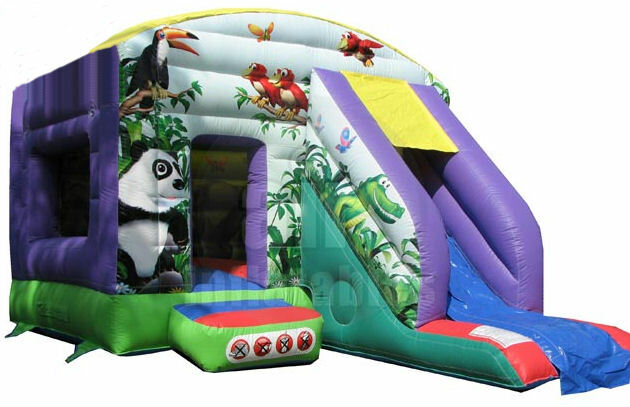 A fully featured Bounce and Slide combo with a sewn in cover, deep bounce bed, netted windows & stunning eye catching 3D Jungle Artwork Theme both inside and on the front. Designed to fulfil the bouncing dreams of any child. A real party favorite. 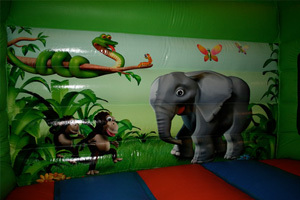 This jungle Bounce 'n' slide is fun for Boy's & Girl's. This Slide Combi / Bounce 'n' Slide has the best of both worlds a good sized bouncy castle together with a larger then usual front slide attached, which allows allows this inflatable device to be used in most gardens & also indoor in most halls. It has a built in Rain / Sun cover, so the children can still have lots of enjoyment with no loss! and it is ideal for all types of party's and events! (w)15ft x (d)23ft (h) 9.5 ft to allow for the inflation tube and air blower at the back of the bouncy castle, and safety mats at the Front & Exit of the Slide.